The Invicta gang ride is a weekly roleplay event which starts in Sunshine at the gas station (4575937 / 4985036) Tuesdas nights at 9:00pm EST. 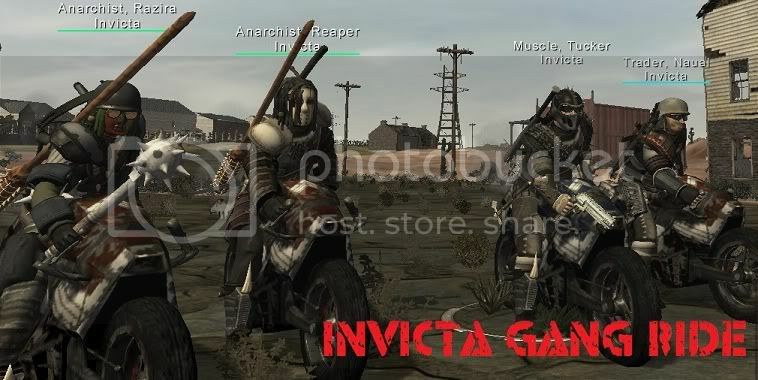 Come and join other gang members as we ride though sector 2 claiming our turf from Raiders and Union Officers and end the night an unknown camp site. Read more about Invicta Weekly Gang Ride. The short version: Mainly bug fixes. My bike won't get hurt as much when I'm running cross-country. Fallen Earth's First Night info announced! Read more about Fallen Earth's First Night info announced! Leech's of Invicta Roleplay Event. The Leech's of Invicta will be meeting at Kristo's Rest on Monday Dec. 14th at 9:00pm EST in the post office for their monthly payments, job announcements and whiskey...This is a small roleplay event for those in Leech's of Invicta as well as those interested in joining the crew. Contact Tucker for question and more details. Read more about Leech's of Invicta Roleplay Event. MMORPGS has an article with a good glimpse into Rise of the Godslayer, AoC's first expansion. Read part one of the article here. Read more about Invicta Weekly Bike Rally! inc gamers has this article on what's coming in Update 6, including some info on Toth Amon's Stronghold and some details on the Guild Renown system. The guys over at MMORPGS.com have posted some new screenshots for Star Wars: The Old Republic, featuring Force Users and Companions. You can find these and more screenshots on the official page here. Because of the interest in Star Trek Online, I've created an STO group for Invicta. To join and see the STO forums, just head to the group page and click the link to request membership. ign.com has an interesting beta video on Fleet Actions for Star Trek Online. I've got to say, I'm still disappointed each player is a starship captain, but this looks like it could be fun at least for a little while, as a secondary game. As if one patch wasn't enough this week, here's another! The Sith Inquisitor and Jedi Consular revealed! A couple of articles have hit the web on ST:TOR's recent revelation of the Sith Inquisitor and Jedi Consular. You can read MMORPGs.com article here and an interesting review on DarthHater's blog here. Read more about The Sith Inquisitor and Jedi Consular revealed! Some nifty tidbits in this interview, including a few more hints on what will be involved in camps and plans for future expansion. Its a bit short for my tastes, but still looks promising. Fallen Earth is going down today for a small patch. Looks like mainly a few minor bug fixes into this one. I'm hoping that means the dev team is hurredly working on the big Social patch coming out in a couple of weeks! Looks like Guild Renown and T3 raiding in update 1.06 are the big news in this months letter... though Morrison spends an inordinate amount of time on a game show in Korea and balance issues. Click here for the full letter. Check out this interview MMORPGS.com did with Craig Morrison about melee versus ranged combat and what FunCom intends to do to correct game balance in AoC. Interview with the Fallen Earth Project Manager on MMORPGs.com! An interesting interview with Colin Dwan, Project Manager of Fallen Earth, with some juicy tidbits on what's coming up in the next major patch... including the CONSTRUCTION tradeskill! Player housing, here we come! Read the article here! Read more about Interview with the Fallen Earth Project Manager on MMORPGs.com! The guys at MMORPGS.com got to visit Cryptic Studios and check out some Star Trek Online. Read the full article here. Read more about Invicta Bike Rally! Are people still interested in doing Ops?